The active cache feature does not support the Save Changes and Send as E-mail options for active reports. In order to save an active report, ensure that your Temporary Internet Files setting is set to Automatic. From your browser File menu, use the Save Page As option. For example, in Internet Explorer, select Save as. In the Save as type drop-down list, select Webpage, HTML only. Starting with WebFOCUS Release 8.0 Version 01, if you have included the command SET AROUTPUT = EXTJS in the profile or in a WebFOCUS procedure that generates an active report or document, you cannot use the browser Save as option to save the active report or document. 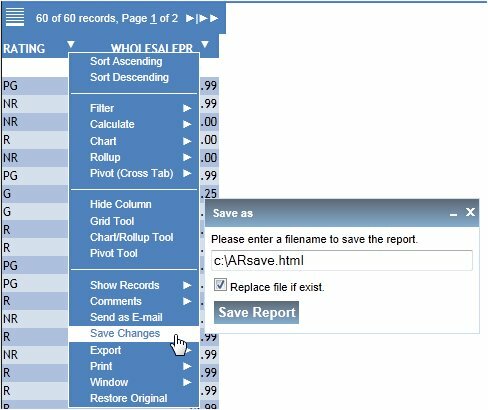 Make sure to change the command to SET AROUTPUT = ALL to allow users to save the report or document with the Save as option. For more information on the SET AROUTPUT command, see How to Control the Generation of the Active Technologies for HTML Output File. Starting with WebFOCUS Release 8.0 Version 02, make sure that the IBIF_active_extjs parameter is set to NO in the WebFOCUS Administration Console to use an active report or document (format AHTML) in a fully disconnected mode that supports the browser Save as option. You can find this parameter in the General category of Client Settings in the Configuration menu of the WebFOCUS Administration Console. For details on this parameter, see the WebFOCUS Security and Administration manual. Alternatively, you can add the command SET AROUTPUT = ALL to the WebFOCUS procedure that generates the active report or document. Click the arrow in any column heading, select Save Changes. The Prompt dialog box opens. To use the Save Changes option, you must enable ActiveX® in your browser security settings. If a filter is applied to the active report, Filtered Only appears as an additional option in the Save as dialog box. Click Filtered Only to save only the filtered result instead of the entire report. If the active report is part of an active dashboard, Selected Grid Only appears as an additional option in the Save as dialog box. Click Selected Grid Only to save only the active report that you selected on the active dashboard instead of the entire dashboard with multiple reports. Enter a file name and location (or keep the default) and click Save Report. The report is saved with the most recent modifications applied. The original report name does not show these modifications. Click the arrow in any column heading and select Print. You can print All records or Filtered only. Select All records to open an HTML-formatted page, showing all records, in a new browser window. Select Filtered only to open an HTML-formatted page, showing filtered data, in a new browser window. Tip: Click the arrow in any column heading and select Filter to filter data. For more information about filtering, see Filtering and Highlighting Data. The print dialog menu automatically appears when selecting a print option from active reports. The data is sent to the printer. Browsers other than Internet Explorer, such as Mozilla Firefox and Safari, do not support the Export XML (Excel) feature of HTML active reports. A limitation for browsers other than Internet Explorer, such as Mozilla Firefox and Safari, is the unavailability of the export directly to Microsoft Excel function in the HTML active report. The export directly to Microsoft Excel function in HTML active reports requires ActiveX controls, which are supported only when you use Internet Explorer as the web browser. The active report menu options Export to HTML and Export to CSV (comma delim) export data in Unicode (UTF-16) only. Exporting data in an encoding scheme other than Unicode is not supported. For instance, in the Save HTML Document dialog box in Internet Explorer, you must select Unicode from the Language drop-down list. The requirement that you export data in Unicode applies to all platforms. Click the arrow in any column heading, select Export, and then click the format. Formatting is only preserved for reports that are exported in HTML format. If you export data to HTML and then change the file extension in the Save as dialog box to .xls, when you open the file in Excel, it does retain all formatting. Select All Records or Filtered only. A new browser window also opens that shows the exported data. This data shows due to browser security features. Navigate to a location to save the exported file, enter a name, and click Save. A second window appears in the browser when you export content to XML (Excel). Since exporting content to Excel is done using XML, this second window appears in the browser during the export process, which performs a security check on the data. To prevent this second window from appearing, give the file name an explicit Excel extension (.XLS) in the Save dialog. Column titles and field values for ACROSS sort fields are not exported to CSV and XML (Excel) formats. Field formats with dollar signs and decimals are not exported to CSV and XML (Excel) formats. They export as plain integers. Note: Currency is exported with a symbol such as the dollar sign when you use the Export XML (Excel) option in an active report. How a negative currency value is displayed in an exported Excel file depends on whether active cache is enabled or not. With active cache enabled (ON TABLE SET WEBVIEWER ON), -$13.00 is displayed in the Excel file as -$13.00. With active cache disabled (ON TABLE SET WEBVIEWER OFF), -$13.00 is displayed in the Excel file as ($13.00) in red. 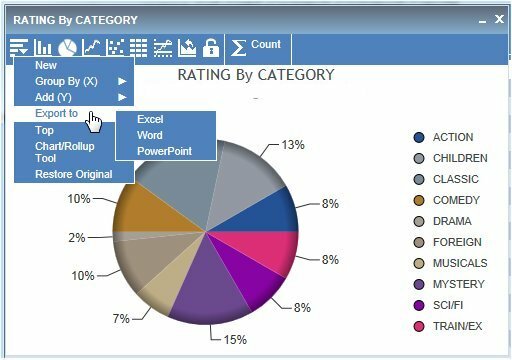 When you export charts, the selected application opens and a chart is created in a new worksheet, document, or presentation. You must use Internet Explorer as the default browser in order to successfully export data to a Microsoft Office application. Ensure that ActiveX controls are enabled in your web browser security settings. From your web browser, select Internet Options from the Tools menu. Ensure that ActiveX controls and plug-ins are enabled. Run your active report and create a chart. From the chart window, select the Export To option from the first chart icon, as shown in the following image. Select Excel, Word, or PowerPoint. The chart is exported to the selected application. The chart opens in the corresponding Microsoft Office application. The following image is an example of a chart exported to Excel. The following image is an example of a chart exported to Word. The following image is an example of a chart exported to PowerPoint. You must use Internet Explorer as the default browser in order to successfully send active reports. Browsers other than Internet Explorer, such as Mozilla Firefox and Safari, do not support the Send as E-mail feature of HTML active reports. A limitation for browsers other than Internet Explorer, such as Mozilla Firefox and Safari, is the unavailability of Send as E-mail functions in the HTML active report. Send as E-mail functions in HTML active reports require ActiveX controls, which are supported only when you use Internet Explorer as the web browser. Click the arrow in the heading of a column and select Send as E-mail from the menu. If a filter is applied to the active report, Filtered Only appears as an additional option in the Prompt dialog box. Click Filtered Only to send only the filtered result instead of the entire report. If the active report is part of an active dashboard, Selected Grid Only appears as an additional option in the Prompt dialog box. Click Selected Grid Only to send only the active report that you selected on the active dashboard instead of the entire dashboard with multiple reports. 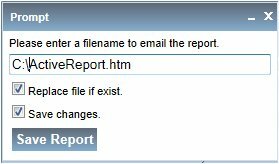 Enter a file name and location (or keep the default) and click Save Report to save the active report as a HTML document. If Microsoft Outlook® is your default email system, a message is opened with the AHTML report as an attachment. 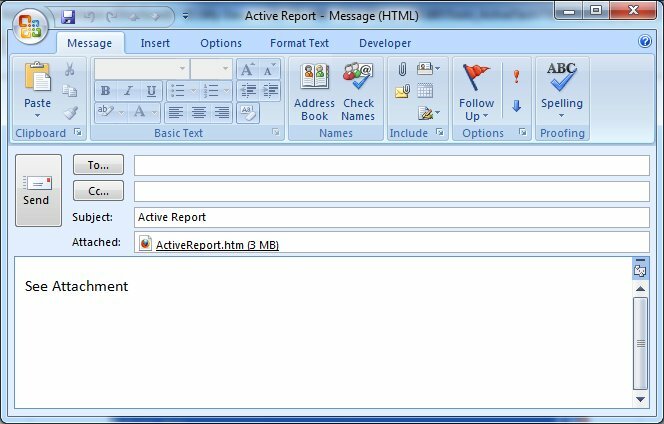 If Microsoft Outlook is not your default email system, save the active report as an HTML document and attach the file to your message. Note: When using Internet Explorer 7 and Microsoft Office Outlook 2003 or 2007 on the Windows operating system, you may receive the error message Access is denied if you click the attached HTML file to preview the active report or active dashboard before you send it. Once the email message is sent, the HTML file opens and the active report or active dashboard appears correctly on the machine of the email recipient. All resizing of images should be done outside of Developer Studio and image size should not be larger than 200x200 pixels. Embedding images does not support sizing or positioning of the image and it uses the current size and default position for that object. Larger images increase the time required for conversion and the loading of the report in the browser. There are multiple ways to generate images for active reports. You can do one of the following, but not both. From the Images tab of the Report Options dialog box, click the Browse button. In disconnected mode, images for AHTML reports must be JPEG images. Select Developer Studio Desktop from the Look in drop-down list. Double-click Projects on localhost, WebFOCUS Environments, or Windows Desktop, and navigate to the image. From the Location drop-down list, click Page Header or Page Footer to indicate the placement of the image in the report. The image is added to the image list. Click OK to apply and save your selection. The image is added to your apps directory and inserted into your report at the selected location. Type a full or relatively qualified URL path in the Image Source input field. Select the Include as Reference check box. Click Add to add the image to the image list.